Start off your visit on the 26th (Sun): meet the residents at San Diego Zoo. On the 27th (Mon), you'll have a packed day of sightseeing: see the interesting displays at USS Midway Museum and then enjoy some diversion at Balboa Park. For ratings, more things to do, where to stay, and tourist information, go to the San Diego trip itinerary website . Newark to San Diego is an approximately 6.5-hour flight. You can also do a combination of train and flight; or drive. Traveling from Newark to San Diego, you'll gain 3 hours due to the time zone difference. Traveling from Newark in May, San Diego is somewhat warmer at night with lows of 61°F. Cap off your sightseeing on the 27th (Mon) early enough to go by car to Long Beach. On the 28th (Tue), contemplate in the serene atmosphere at Glass Church / Wayfarers Chapel, then admire all the interesting features of StubHub Center, then see the interesting displays at Cerritos-Astor Classics, and finally kick back and relax at Bluff Park. To see traveler tips, reviews, other places to visit, and tourist information, you can read our Long Beach trip planner . You can drive from San Diego to Long Beach in 2 hours. Other options are to take a bus; or do a combination of flight and bus. In May, daytime highs in Long Beach are 75°F, while nighttime lows are 59°F. Finish your sightseeing early on the 28th (Tue) to allow enough time to drive to Beverly Hills. Beverly Hills is a city in Los Angeles County, California, United States, surrounded by the cities of Los Angeles and West Hollywood. 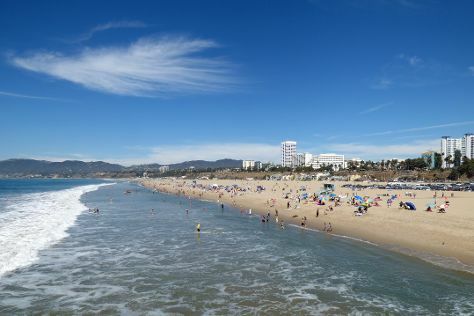 Start off your visit on the 29th (Wed): take a stroll through Montana Avenue, then immerse yourself in nature at Santa Monica State Beach, then make a trip to Santa Monica Pier, and finally explore and take pictures at Mulholland Drive. To find where to stay, reviews, more things to do, and more tourist information, use the Beverly Hills trip maker . You can drive from Long Beach to Beverly Hills in an hour. Other options are to take a bus; or ride a tram. In May, plan for daily highs up to 71°F, and evening lows to 58°F. Finish your sightseeing early on the 29th (Wed) so you can drive to Los Angeles. Kick off your visit on the 30th (Thu): find something for the whole family at Universal Studios Hollywood. Get ready for a full day of sightseeing on the 31st (Fri): admire the landmark architecture of Walt Disney Concert Hall, then appreciate the extensive heritage of Hollywood Walk of Fame, then put a fun spin on your tour with Fantastic Race, and finally see the sky in a new way at Griffith Observatory. For reviews, traveler tips, more things to do, and more tourist information, use the Los Angeles day trip tool . Los Angeles is just a stone's throw from Beverly Hills. In May, daytime highs in Los Angeles are 75°F, while nighttime lows are 59°F. On the 1st (Sat), wrap the sightseeing up by early afternoon so you can travel back home.